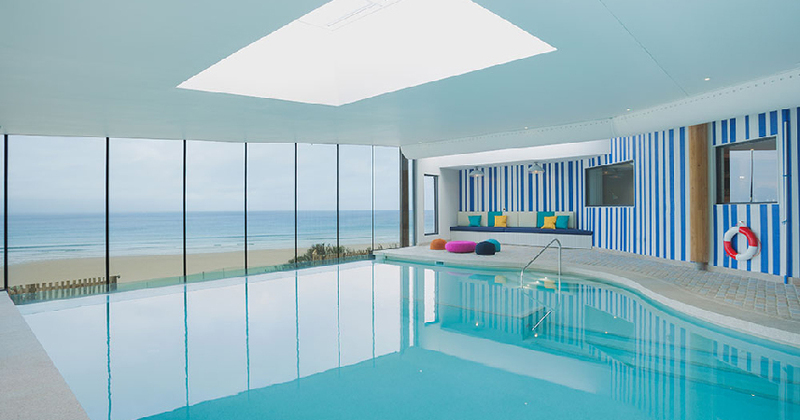 It is often said that a change Is as good as a rest and at the end of a busy season a friend and I take off to the Watergate Bay Hotel on the north coast, just half an hour from home to enjoy both in the form of a relaxing spa day. 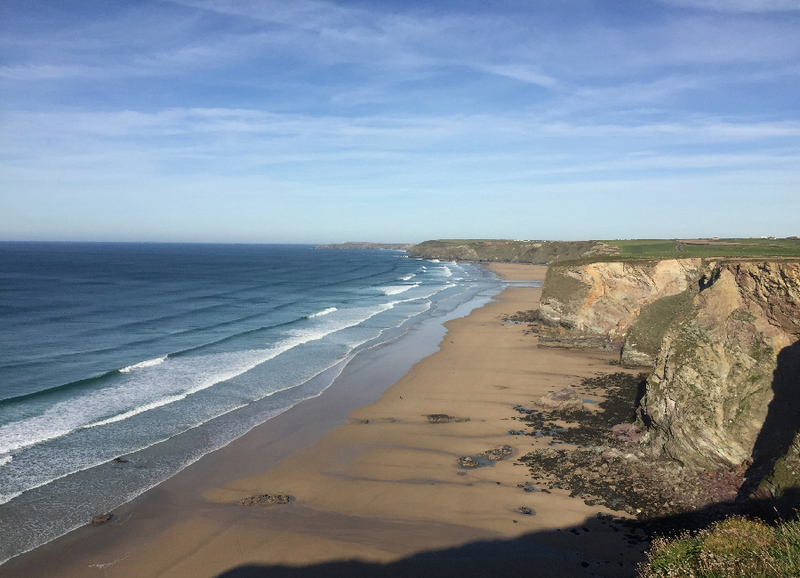 Cornwall is so diverse that a short drive will take you to a landscape quite different from home without the need for stressful travel and scenery so magnificent that it ranks with world class destinations. 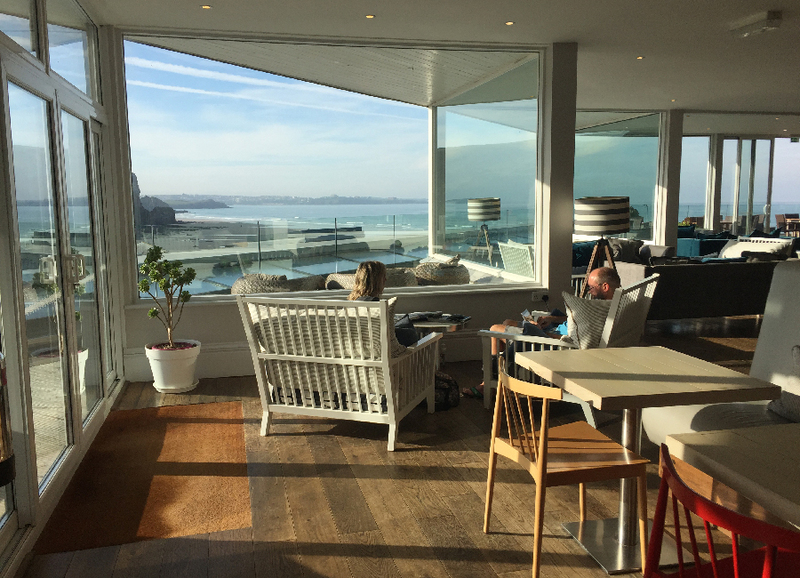 Whenever I go to Watergate Bay Hotel or Fifteen restaurant, I look out to sea and feel as if I am sitting in a picture. The wide expanse of beach, the ever changing sky and the rolling surf fills me with awe and I am thankful to have it all on my doorstep. The hotel is situated on the beach and furnished in coastal style with bright fabrics, wooden walls and zingy wallpaper. The staff are bright, young and helpful, (many of them fitting work around surfing!) and the atmosphere is totally relaxed. It always makes me smile that on the way in you almost trip over buckets and spades and the entrance hall and staircases are always covered in sand and I think they employ someone to go up and down all day with a hoover to try and keep it clean. Dogs are welcome here too and families with children. There are two restaurants, one formal and one completely relaxed with a great range of simple but delicious food. We usually take a long coast walk, have lunch and book in for a treatment in the swim club. There is a good range from massage to reflexology or facials, pedicures and manicures. The infinity pool is delightful, you feel as if you are going to swim into the sea, and there is a wooden hot tub out on the deck with views over the beach. The hotel welcomes day guests to the Swim club from Monday to Friday and you can choose a package which includes lunch. Go on, spoil yourself ………we did and can’t wait to go there again.